SMALL KUCING: My Kleenex® 3-Ply Scented Facial Tissues Uses. Wokay....how many of you have read the Press Release that we post up last Saturday titled "FIRST-EVER KLEENEX® 3-PLY SCENTED FACIAL TISSUES USE THE SCIENCE OF SCENT TO INSPIRE UPLIFTING EXPERIENCES IN OUR LIVES". If you have not done so, guai-guai go there and read ya. Kleenex® is giving FREEBIE. Yup! They are having the "Power of Scent" movement and are giving Kleenex 3-Ply Scented Tissue. Head over to the said post to see how to request ya. Last Friday I received Mamarazzi received a box each of Kleenex® 3-Ply Scented Facial Tissues : Rose and Cherry Blossom coz am so cute. It got a bit wet due to the rain as we came home late but still okay la. So how would you use these lovely scented tissue paper? Wipe my your sweaty forehead because I/me you went into the junkyard store room to dig up the "Christmas Tree" coz I/me you wanna set up the Christmas tree fast so that can hint to all the kind Uncles and Auntie, hensem Kor Kor and Pretty Jie Jie out there to send me you some Christmas pressie. Kleenex® 3-Ply Rose scented tissue sure have a lovely scent. Can cover the sour smell of of sweat. Guess that would be the usual uses of tissue paper ya....wipe fingers and mouth with it after eating durian or banana leaf rice. But surely that is not the only uses of Kleenex® 3-Ply scented tissue. I would suggest to use it as pillow and bolster too during examination period. Hey, don't laugh. Am serious. Am sure most of you had watch old Chinese drama ,right? People in the old days uses a block of wood or something like that as pillow. Am pretty sure those rich folk in the old days would have used some scented wood as pillow and the Emperor would be using something similar. Hence , my suggestion is not that ridiculous. Anyway, plenty of research had show than our mood can be influence by scent. Even if you don't believe in all those research, am sure you can believe you nose. Don't you feel happy when you you smell a scent that makes you recall all the happy moments? Waking up to the scent of cherry blossom certainly will rejuvenate my sense and be more alert during examination. I would suggest Kleenex® to come up with Rosemary scented tissue coz smelling Rosemary can increase the power of our memory. So that I can recall what I have read can will be able to vomit out write it out during examination. Second uses is for guys with many girlfriend . Christmas time and Valentine Day time can be pretty bad for the wallet. How to save money and yet makes girls swoon? Easy...grab a few boxes for Kleenex® 3-Ply scented tissue and D.I.Y. some pretty scented roses for your girlfriend(s). Most girls would love it coz they will say handmade gifts show how much a guy cares for them. Hey, don't shoot me. Mamarazzi didn't give me any pocket money. Therefore I can't buy pricey gifts and roses for my girl friends. On Mother's Day you can also make her happy by turning these Kleenex® 3-Ply scented tissue into carnations. 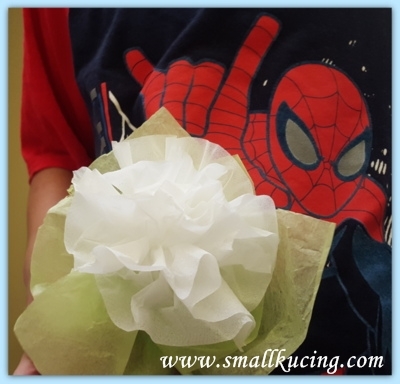 Tie the middle with a green floral tie and fold up the "flower". Then you can gently "peel" open the petals. Jeng! Jeng! nice or not? Even Spidey will give you a Thumbs Up. Errr...if you don't quite like the white color..well...some people "pantang" to be given white flowers, you may use marker pen to color the edges. It would make a lovely Carnation for your mom. It would be great if Kleenex® various colored tissue papers. Not only for art and craft but there are some people who would like to have a personalise colored tissue paper. For example, on Monday I would love to have some red or yellow tissue paper to energise me to begin the week and on Friday, maybe some blue tissue paper to calm and relaxes me. Scent and colors do pay an important part when comes to the part of lifting up someones mood. Hmm...come to think of it...I have to make more of these. Can put up on my Christmas trees as scented decorations too. The tree would have a heavenly scent. Don't you agree? Before I suggested these idea, Mamarazzi already one step ahead of me . 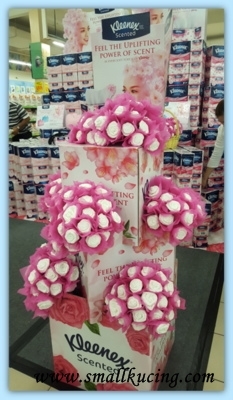 She saw Kleenex® having the "Power of Scent" promotion in a hypermarket. 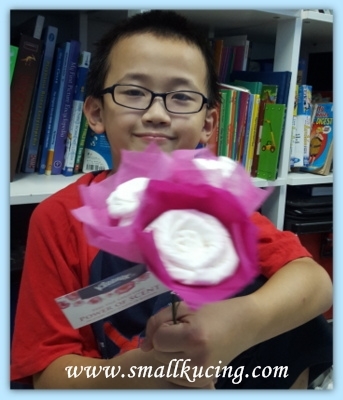 Managed to "bodek" the promoter for one of the scented roses made from Kleenex 3-Ply Scented Tissue. Why did she want it? Coz she wanna attach it to a small gift. It's just a tiny gift. 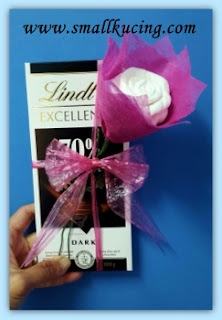 A "Thank You" to my Class Teacher who suffer my naughtiness teach me whole year. Hopefully, after smelling the "rose" , she will have a great school holiday before back to torture room school for another great year. wah .....so artistic and creative! No wonder aunt Reina also making one since she so Bo Liao now. ... so glad, U learned how to make flowers out of Kleenex, lil kitten ... I did that a lot when I was a lil kitten like U ... Love U ... cat. Aiyorrrrr!!!! 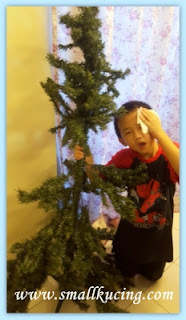 Just took out the Christmas tree already sweating like that kah? Muahahahaha!!!! Yes, great idea. 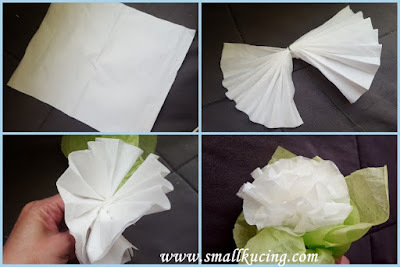 Can use the tissue paper to make all the flowers to decorate the Christmas tree, that would look very nice. The handmade tissues flowers look so nice on the Christmas tree, good one, I like! Very nice, your tissue flower. All set to 'kau' the girls... on a low budget kekeke. You are very imaginative and talented! Loved your idea of using it as a pillow and those beautiful flowers you made using the tissue!! So now tissue paper is not just tissue paper for lap lap. Can use for decorations and sweet smells too. I more attached in buying wet tissues due to its flavourful scene but now when I see this post, make me wanna go and buy whole box. I love everything that smell nice, like perfume, hand lotion, wet tissues. Hahahaha.